The appearance of Proteus to the mother of Apollonius of Tyana, and the subsequent references to this minor deity later in the text, carry a heavy load, almost an overload, of implications. Through Proteus the work announces its own stylistic complexity (poikilia), the versatility of its protagonist and the changeability of his metaphoric characterisation. The riskiness and uncertainty of this allusion, evoking both wisdom and slipperiness, changeability and lack of constancy, are a large part of its appeal for this deeply ambiguous text. 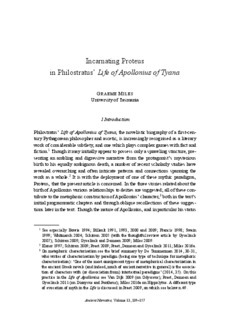 Beyond this, Proteus provides a means of approaching two separate ideas about Apollonius' nature, as a god incarnate and as a 'normal' human soul undergoing a sequence of incarnations. It is also possible that the choice of Proteus is in part motivated by an allegorical understanding of this figure as representing the Platonic notion of processions of souls under the guidance of particular deities.